Anza-Borrego Desert State Park offers the mountain biker a wide variety of trails for all experience levels. There are more than 500 miles of roads that are open to bicycles in the park. There are routes up rocky hills, through deep sand, along scenic streams and down steep hills. Both primitive jeep roads and paved roads are open to bicycles, but bikes are excluded from all hiking trails unless they are specifically designated as bike trails. Riders must stay on roadways at all times and may not venture off searching for firmer ground. Grapevine Canyon is a very popular downhill mountain bike route. The Blair Valley area is relatively flat and scenic as well. Oriflamme Canyon is very steep and physically demanding as it climbs high above the desert floor into the chaparral. This guide includes brief descriptions of some of the best biking areas to help you plan your trip. It is recommended that you refer to more detailed mountain bike guide books or talk with someone familiar with the routes. Get a good map, and carry it with you. It is also a good idea to check with the park staff for the latest conditions. Ride right through the split and enjoy the view from inside a mountain. This is a sandy road with a fairly gentle grade. Park at the mouth of the Fish Creek wash along Split Mountain Road. Ride in 4 miles to the Wind Caves trailhead. You can enjoy spectacular geologic formations at the Wind Caves as a unique side trip, if you are willing to leave your bike and walk. Here you can find a long, downhill ride if you start down the Jasper Trail near Ranchita on the west boundary of the park. Stay on Grapevine Canyon road to avoid hills and rough riding. You'll enjoy shady trees and springs, but watch for 4-WD traffic. Yaqui Wells is a good spot to rest and watch birds and perhaps other desert critters. (13 miles one-way with vehicle shuttle). Starting at Pinyon mountain at about 4000 feet, you will see the incredible diversity of this area as you work your way down to sea level. The 28-mile route down toward Split Mountain offers plenty of coasting, but also some deep sand and a scary drop-off (you'll want to walk it down). You will need a vehicle shuttle, or else make a shorter tour coming in from either end. Pinyon mountain is a popular camping spot. You'll find several interesting loop routes using Buttes Pass Road, Goat Trail and San Felipe wash. These routes are all in washes which may mean deep sand at times. Check current conditions before venturing out. 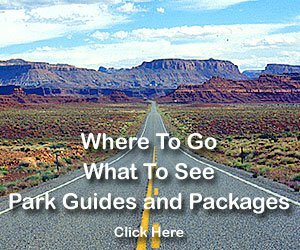 Park at the Carrizo Overlook on Highway S2 and enjoy the ride down Canyon Sin Nombre. Explore Carrizo Creek or Vallecito Creek or make a loop using Arroyo Tapiado and Arroyo Seco del Diablo. The desert is a wonderful place to ride, but it can be dangerous if you are not prepared. Every year, people get in trouble, some even die. The desert is not a forgiving environment. Keep in mind a few simple guidelines for a safe ride. Always carry plenty of water. One gallon per person should be a minimum! Don't forget to drink it. It does you no good in your water bottles. Know your limitations in the heat and rugged desert terrain. Temperatures can reach 125 degrees F.! Protect yourself from the sun. Use a hat and sunscreen. Use maps. Detailed topographic maps of the entire park are available at the Visitor Center and at local businesses. Make sure your bike is well maintained and dependable. Bring along tools and adequate spares. There are lots of thorny plants in the desert - consider using a tire sealant in your inner tubes. Don't ride alone. Use the buddy system. Tell someone else about your trip plans. If you find yourself in trouble, don't panic, help will soon be on the way. All park hiking trails are closed to bikes unless designated as bike trails. Do not ride faster than safety and common courtesy dictate. The vehicle code considers park jeep trails the same as city streets. Helmets are required for riders 18 years old and younger. They are strongly recommended for all bicyclists. Keep to the right, single file on paved roads. Bikes share park roads with horses, hikers and vehicles. Always give way to horses and hikers, and you should yield to most vehicles. Please give right of way to the downhill rider unless there is adequate room to pass. When passing another rider, tell them on which side you intend to pass them. Downhillers, when passing an uphill rider, let them know how many other riders are descending behind you. Do not obstruct the trail. Move off the trail when stopping. When you see wildlife on the trail or nearby, back off, move out of the way, or go an alternate route. Stay out of wet areas (streams, wetlands, mud). If you can't, get off your bike and carry it across the driest route possible, but don't detour off-road. When descending very steep stretches, stand on your pedals and transfer your weight to the rear of the bicycle. This puts your center of gravity over the back tire which minimizes skidding. When you ride the brakes downhill it can cause rutting and erosion. Education is the key. Pass the word to the new riders in the area. You can help preserve our deserts. 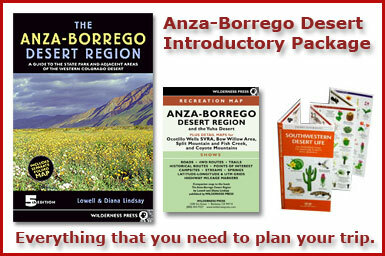 With more than 600,000 acres, Anza Borrego Desert State Park, has 7 unique areas that you can explore. Anza Borrego Overview A video overview of all the fascinating places in and around Anza Borrego Desert State Park that you can visit, from the Gomphotherium Park in Borrego Springs to the Pumpkin Patch and much more! Watch this video to get an idea of the range of geologic features available to check out in the Park. Carrizo Badlands - Video of Mud Caves and Canyon Sin Nombre The length of the mud caves varies, with some extending over 1000 feet and featuring ceilings as high as 80 feet. Caves have been reported up to 35 feet wide, and others so narrow, you have to squeeze through openings. Multi-level caves with skylights have been found, where erosion has created an opening, or sinkhole, in the ceiling of the cave. 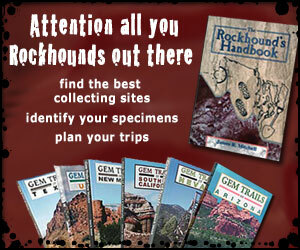 Some of the caves are fairly easy to navigate while others may require you to crawl in sections. Centered in the arid Borrego Badlands due east of the Visitors Center between County Road S-22 and Route 78, four million years of geologic and paleontologic history are exhibited across a stark desert landscape. Join the crew of DesertUSA and take a road trip to Fonts Point, maybe the best place in North America to view sediments of the Pliocene and Pleistocene Epochs.